The human brain is a major part of the central nervous system (CNS). The CNS and the peripheral nervous system (PNS) are two major sections of the human nervous system. The CNS comprises of the brain and the spinal cord, whereas, the PNS connects the CNS to primary sensory organs of the body such as the eye, ear, nose, etc., and other organs of the body. It comprises of the spinal nerves, 12 cranial nerves, and the autonomic nerves which regulate the cardiac muscles, blood vessel wall, and gland muscles. The CNS receives information from the sensory organs and resends this information to the PNS. This chapter gives details on the human brain and its constituent features. 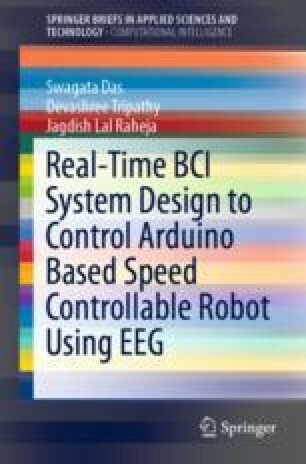 It also discusses electroencephalography (EEG) recording, the physics behind it, EEG electrodes, their composition, and other necessary details. The last section is about the conventional EEG placement methodologies. Aliki, M., and V. Emmanouel. 2008. Polysomnography: Recent Data on Procedure and Analysis, http://www.pneumon.org/assets/files/Archive/PNEUMON_2008-4.pdf#page=44.